One of the most beloved forms of entertainment is live music. Did you know concerts can be enjoyed throughout your city everyday? 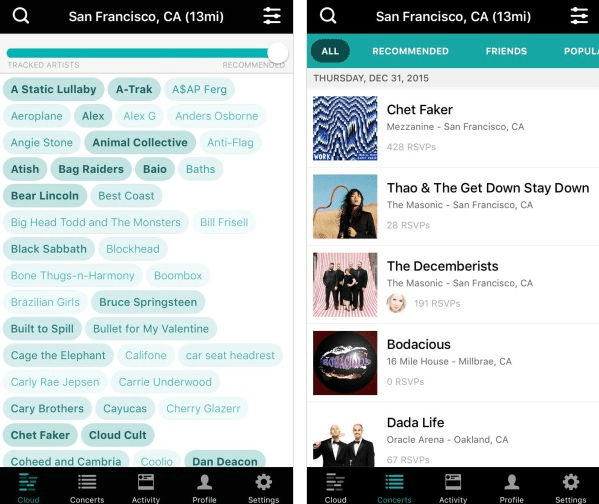 ABCey Events loves to stay in the know on all the upcoming concerts, events, and happenings here in the Bay Area, and this is concert app is great for that! Bandsintown is also user friendly on both iOS and Android! This awesome app makes concert searching a breeze by allowing you to track your favorite artists and receive alerts when they are in town! Make finding your favorite bands in town an easy process! This free app scans your music libraries, like Spotify, iTunes, Google Play, Soundcloud, Deezer, and Rdio to find the artists and genres you enjoy. Also, this app tells you about great artists and DJ’s headed your way. Because Bandsintown connects with your Facebook and Twitter, you can discover similar artists to the ones you love! Bandsintown lets you to keep track of the shows you have RSVP’d to. Wheather you are just interested or actually attending, this app keeps you in the know of events coming up! Once you’ve RSVP’d, your calendar will sync with Bandsintown so you never miss a show! Don’t forget to share your concert details with your friends on Instagram, Facebook, and Twitter. Once you browse Bandsintown to find the upcoming tour dates of your favorite artists, you can easily purchase tickets through hundreds of ticket sites like Ticketmaster, LiveNation, and Eventbrite. Additionally, they offer in app purchases to make it extremely easy to get your reservations on time! If there is any issue with ticket sales, there is a Feedback button to report any ticketing mistakes. Bandsintown works with Desk.com so you get fast and helpful service for any “concert going needs”. With living in such a passionate age for live music, this concert app works hard to connect us to the artists we love! Do you love Bandsintown as much as we do? Let us know in the comments below or on Facebook and Twitter.